A Spritesheet of my Cover of Jevil. 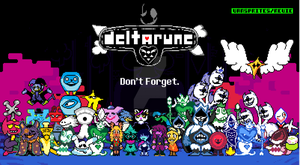 Deltarune and Undertale owned by Toby Fox. ok jevil lets se how you got! Looks like Jevil's giving a kid a little mania. Jevil is now giving out swirlys. after seeing this, a beauty is joying in my heart! even devilsknife is smiling! Why did you make him so cute? Hey there. I made a DeviantART account just to ask permission to use that "bouncing" sprite ina fan video I'm making. I just need a looping background, and that animation would work well for it. I'll credit, for sure, and link back to your DeviantART page.